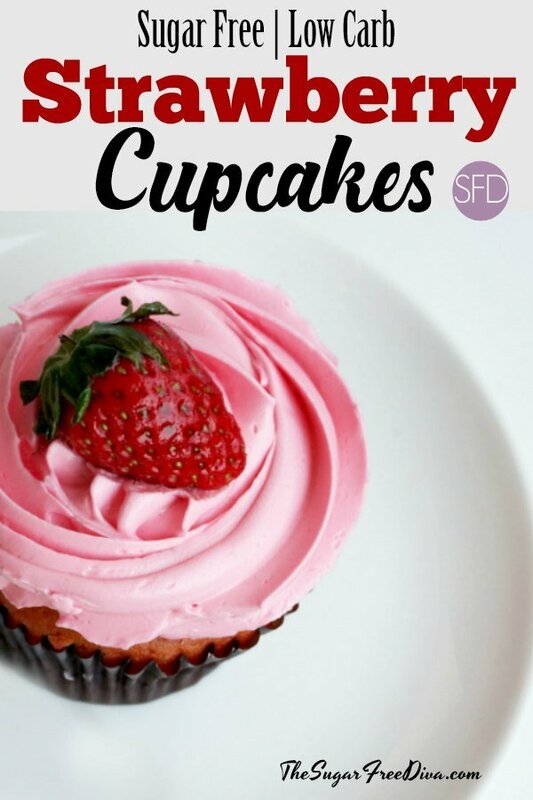 These Sugar Free Strawberry Cupcakes are the perfect compliment to everything that we do this time of the year. I like that there are options in this recipe as well. This is the time of the year when I have an abundance of fresh fruit and vegetables in my kitchen. As a result, I am always thinking of new recipes to use that yummy produce in. You may be wondering, strawberries are sweet, how can we make this recipe sugar free? Strawberries actually only contain about one half gram of sugar in each strawberry. An average strawberry has about .7 grams of carbs in it as well. However, if you are concerned about making this recipe totally sugar free, there is an option to do so. 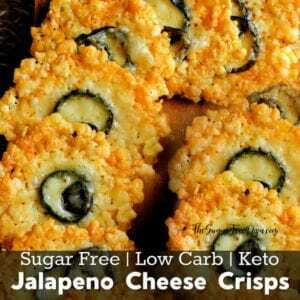 Make this recipe gluten free or low carb. Make this recipe gluten free by using gluten free flour instead of regular flour. Or, you can make this recipe low carb by using low carb Carbalose flour. And, if you want to go without the strawberries, you can opt to use the sugar free strawberry gelatin option. I will be posting a recipe for sugar free strawberry frosting in the near future. Until then, you may want to check out these frosting options for your cupcakes. Stevia Cream Cheese Frosting (low carb, keto, sugar free etc). 4 Ingredient Sugar Free Vanilla Frosting. Sugar Free Pudding and Cream Cheese Frosting. Strawberries- 2/3 cups whole (about 6-8 average strawberries). Flour (all purpose)- 1 1/2 cups sifted. Can sub in low carb or gluten free flour. Usegluten free flour instead of regular flour. Or, you can make this recipe low carb by using low carb Carbalose flour. Butter- 3/4 cup ( 1 1/2 sticks) softened to room temperature. Sugar Alternative- equivalent to 1 cup of sugar. Please use granular for best results. Milk or Cream- 2 tablespoons. Optional- A few drops of red food color, and/or Strawberry flavored pudding mix for added flavor 1-2 tablespoon, or go without the strawberries by using 1 package of sugar free strawberry gelatin 1/2 cup of water (sugar free but, not as good as using strawberries). Start by preheating your oven to 325 and prepping a cupcake tin for nonstick (12 average sized cupcakes). Remove the tops from the strawberries and place the strawberries in a food processor or blender. Then puree the strawberries. You can strain the puree if desired. Set this aside. In another bowl, whisk or sift together the flour and baking powder. Set this bowl aside. Now, in a mixing bowl cream together the butter and the sugar alternative. I use a paddle attachment and set the mixer on medium speed. This will not be as fluffy looking as a sugar and butter creaming. Once this is creamed together you can mix in the strawberry puree. Set the mixer on slow and add half of the dry ingredients from the first bowl (flour). Mix this for about 5-10 seconds and then add the remaining flour. You may need to stop the mixer and scrape the bowl as you do this step. Next you can add the milk and eggs and any optional ingredients one at a time. If you are using an optional flour (gluten free or low carb) please read the package to any adjustments that may have to be made. You will most likely have to add a bit extra of the milk/cream to compensate for the difference. Bake for 22-25 minutes or until a toothpick comes out clean. 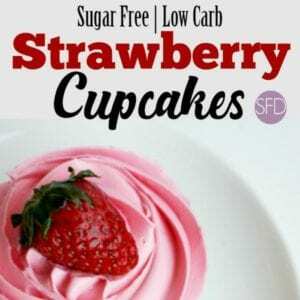 A sugar free way to make strawberry cupcakes. 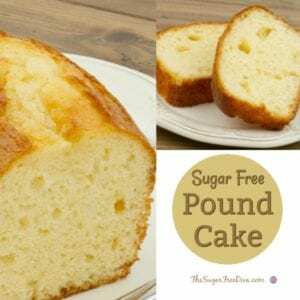 This can be made low carb or gluten free as well. Strawberries- 2/3 cups whole about 6-8 average strawberries. Flour all purpose- 1 1/2 cups sifted. Can sub in low carb or gluten free flour. Usegluten free flour instead of regular flour. Or, you can make this recipe low carb by using low carb Carbalose flour. Butter- 3/4 cup 1 1/2 sticks softened to room temperature. Optional- A few drops of red food color and/or Strawberry flavored pudding mix for added flavor 1-2 tablespoon, or go without the strawberries by using 1 package of sugar free strawberry gelatin 1/2 cup of water (sugar free but, not as good as using strawberries). This looks like a really yummy idea!